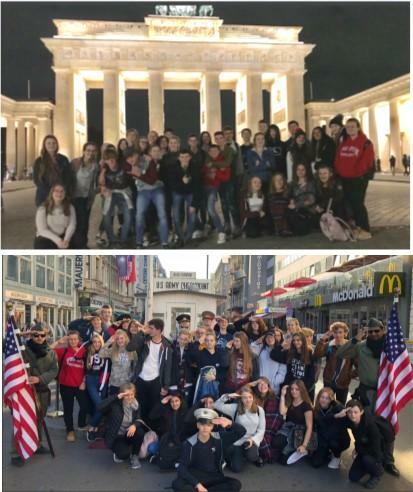 Year 11 History students, currently studying Nazi Germany as part of their GCSE, ventured to Berlin this half term to immerse themselves in German history and architecture. After an early start, the group braved a journey up to the top of the Communist architectural monolith, the TV Tower, where we observed the magnificent architecture, not to mention the vast scale of this sprawling capital city. On the second day, students were fortunate enough to visit Sachsenhausen Concentration Camp. Based in the suburbs of Berlin, this camp offered an insight into the workings of a labour camp. Early inmates were political prisoners; Communists, Social Democrats, Trade Unionists, most of whom were extinguished by the cruel camp regime. This was followed by a peaceful, scenic drive to Wannsee House. As we began our tour of the magnificent lakeside property, the dark history of the site became clear. In January 1942 leading Nazi officials such as Heydrich and Eichmann met to orchestrate the transportations of Jews from all over Europe to their deaths in the Polish extermination camps. Students were fascinated to learn about the ‘desk murderers’ – the bureaucrats who facilitated the deaths of six million. Bowling offered a respite from the history on Friday evening, and teachers were delighted to discover some real hustler talent amongst the group! On Saturday morning we embarked upon a walking tour of this magnificent capital city, taking in the decorative facades and charting how the architecture of Berlin told the story of progress from imperialism to fascism, communist hardship to the thriving European hub witnessed today. We were given an inspiring talk about the terror state at Topography of Terror, a museum based on the site of the old Gestapo headquarters. After a ‘rest’ back at the marvellous hotel (which included fitness challenges and games with the teachers) the group savoured an ice cream whilst walking to the Reichstag before enjoying Berlin at night from the dome atop the Bundestag. Students posed for the obligatory photograph at Checkpoint Charlie and hit the souvenir shops on Sunday morning. Too soon it was time to return, with Sonny Maxwell musing that he could spend ‘at least another week here’. Leah Sibley said that Berlin had lived up to all her expectations, and this reflected the mood from all; what more could anyone ask for than a few days soaking up the culture, sun and history in such a unique city?